I am a bit remiss in posting lately. A whole lot of everything has been going on, but a lot of it hasn't been about historical costuming. While I've been buried in signing leases and lining up contractors and all kinds of moving stuff (more on all that later), I haven't had much time to sew and, well, write about it. So I'm sharing a bit late. But it's good news! Last month I knocked out a quick vintage sewing project. Awhile back I acquired a bunch of gorgeous original 1940s patterns, all of them somehow magically in my size. One of them just screamed "Agent Carter," so I put it together in a couple weekends with a scrummy blue wool blend from Mood Fabrics, everyone's favorite NYC fabric store. Well my dress went on the Mood blog! Squee! You can read all about it, the pattern, and see some more photos o'er there - get in The Mood (Blog). p.s. The shoes I'm wearing are brown and white spectators from the new Royal Vintage Classic 1940s Collection coming out this Fall. They're not available yet, but I will be telling you all about them soon! I LOVE THIS DRESS SO MUCH. Congrats for getting on the Mood blog! Love the dress! Du Barry patterns are some of my favorites. And YES YES YES to those shoes!! Squee!! That's a great dress; I would love to have one myself. And you've accessorized it so well. Such a beautiful outfit! 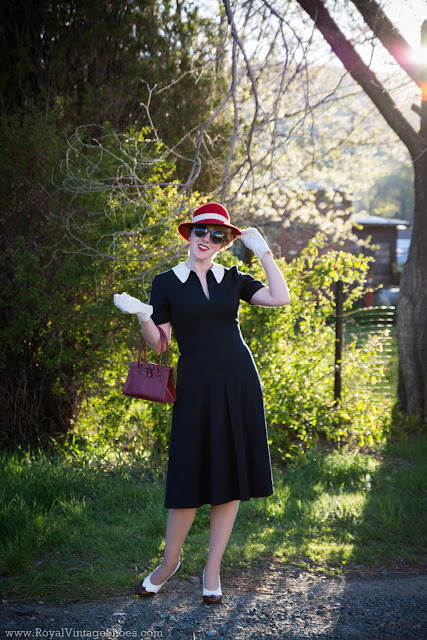 Navy and red is such a classic for a reason :) I haven't seen the show, but I keep seeing all these "Agent Carter" inspired dresses and it is seriously making me want to watch! To quote the show: "Love the hat!"